Another beauty!! A great fun card with the perfect image for your background. I love looking at your cards .. .. and I also love looking at your changing sky and sea. We have a bit of blue sky peeping through the clouds today so I am not quite so envious LOL!! Oh so sweet! I love your color choices...that touch of blue is such a soft touch! 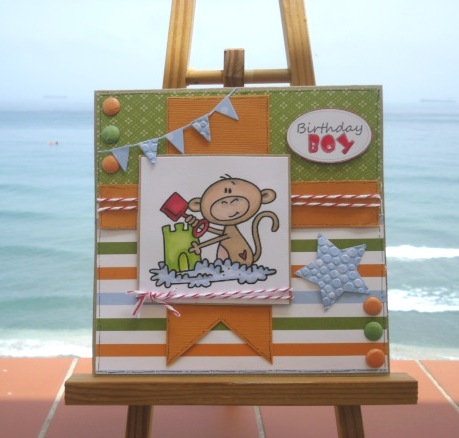 Fabulous layout Sylvie for such a sweet chap! Gorgeous card Sylvie, I like the fun image, the colours and the bunting. These months soon whizz by when you start talking design team cards!!! WHat a sweet bday card! Love that monkey and the banner!! Thanks for your blog visit! What a super Card Sylvie he is a cheeky little chappy , fabulous colours too, well done Hugs Elaine . Wish I had a view like yours to display my cards Sylvie, that view is my hubby's dream view.